When a calendar is shared by a group of people located in different regions of the world, proper handling of time zones and daylight saving times becomes very important. 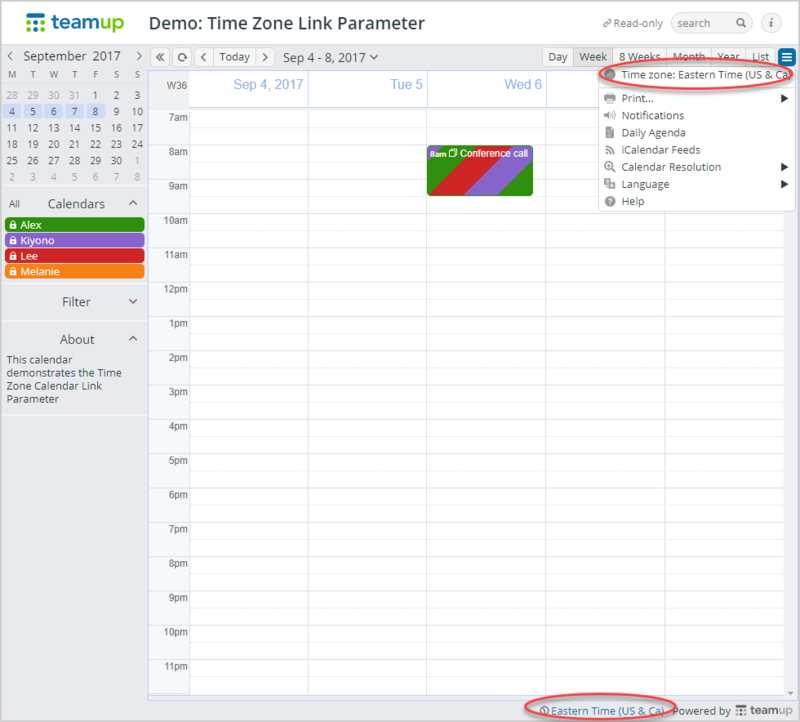 Teamup Calendar offers very flexible time zone support. This article explains how the time zone for a calendar is configured and includes configuration examples for three typical scenarios. Handling time zones is tricky. Every year, many countries switch between standard time and daylight saving time, and, unfortunately, they don’t make these shifts simultaneously. Furthermore, every year, several countries decide to change their time zones or daylight savings time rules entirely. Fortunately, Teamup Calendar helps users deal with that complexity. Teamup Calendar introduced support for time zones on December 9, 2013; all calendars created after that date support time zone conversions and automatically adjust to daylight saving time on the appropriate dates. You can set the default time zone here. In addition, two options enable you to control how Teamup Calendar applies time zones and if calendar users are allowed to select other time zones. Enabling option 2 will automatically enable option 1. If this option is enabled, Teamup Calendar displays the current time zone in the dropdown calendar menu and in the footer (see below). If a user changes the time zone, this selection will be remembered in a browser cookie. The time of all events displayed on the calendar, including event viewer and event editor, is always relative to the displayed time zone. If you need to display the event time in other time zones, simply click the time zone in bottom right and change to the time zone you want. See an example of the same calendar displayed in the time zone of New York and in the time zone of Tokyo. This option determines which time zone is set by default when a user loads the calendar. If this option is enabled, Teamup Calendar will try to detect the local time zone of the user’s location and use it as the default time zone for the calendar. Thus, if a user’s computer has Eastern Standard Time set as the local time zone, the calendar will open in EST. If a user has Central European Time set as their local time zone, then the calendar will open in CET. If this option is not enabled, the time zone specified in the Settings will be used as the default time zone for the calendar. If a user manually selects a time zone, their manually selected time zone will be given higher priority than the detected time zone or the time zone configured in the Settings. If both options are unchecked, the calendar’s default time zone will always be used; calendar users will not see the time zone link in the footer or menu, and will not have the option to change the time zone. Link parameters force certain options for a calendar, when appended to a calendar link. You can append a time zone parameter to a calendar link to force a calendar to be loaded in a specific time zone. 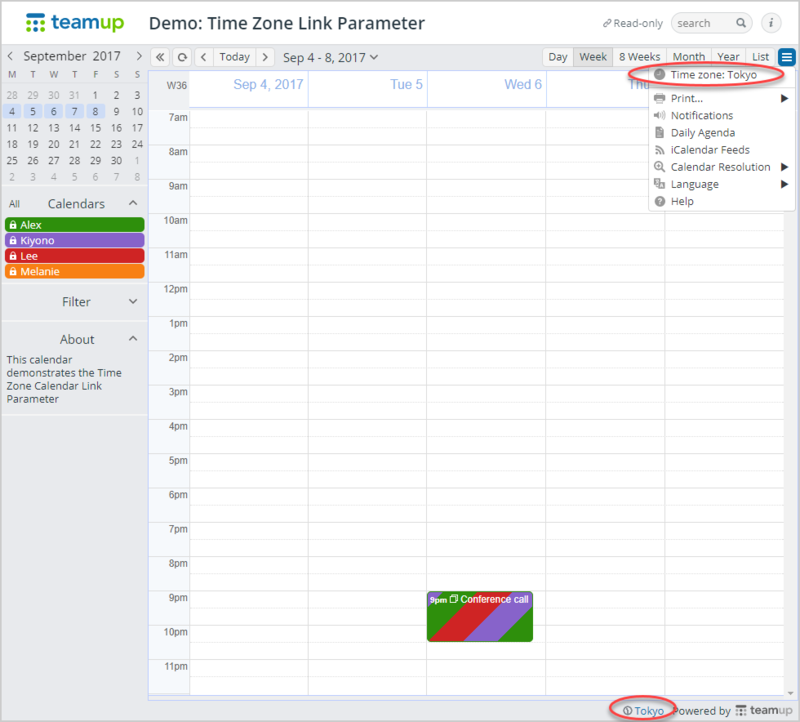 Time zone support in Teamup Calendar is configurable in different ways, so you can use the configuration which works best for your use case. 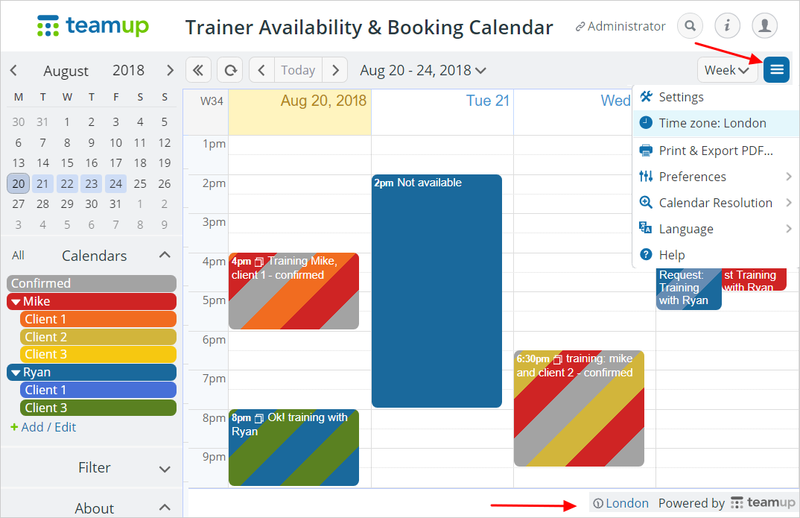 Consider the case of a small local organization managing meeting room reservations with Teamup Calendar. All calendar users are located within the same time zone. Support for the conversion of times between different time zone is not needed. To keep the calendar interface lean, all time zone-related information is hidden. Consider a theater that uses Teamup Calendar to publish their performance schedule on the Internet. Users of this calendar may be located in different time zones. However, since one needs to travel to the theater’s location to attend a performance, it is likely that users would want to see event times in the time zone where the theater is located. With this configuration, by default, the calendar will always show times in the configured time zone of the theater. But users have the option to manually select another time zone, if desired. Thirdly, consider the use case of a project team spread across different continents and using Teamup Calendar to coordinate their virtual meetings using video conferencing. In this use case, each calendar user would need to see meeting times relative to his or her time zone. With this configuration, Teamup Calendar will try to detect the local time zone of the user’s location and use it as the default time zone for the calendar. In addition, users always have the option to explicitly select a time zone. This is useful if the automatic detection does not return the correct or preferred time zone.